VISAKHAPATNAM: The central committee leaders of the CPI Maoists that are housed in the Vizag central prison announced that they would observe a day-long hunger strike in jail on Wednesday on the occasion of World Human Rights Day to protest harassment and threats to tribal political prisoners and their families by the police.A letter, issued under the names of the central committee leaders including Amit Bagchi, Baccha Prasad Singh, Akhilesh Yadav, Narla Ravi Sarma, Vijaya Kumar Arya and Andhra-Odisha Border (AOB) area leaders Manda Yesobu alias Jaipal, and Marpu Venkata Ramana alias Jagadeesh, was sent to the TOI office on Tuesday. In the letter, the Maoist leaders demanded that the government stop illegal arrests and threatening family members of prisoners. “The intelligence cops should stop contacting tribal prisoners in jail or in the courts during hearings. Maoists political prisoners should not be re-arrested once released from jail. Cases should be expedited by filing chargesheets in the shortest possible time and in cases that is not done, self bail should be granted,” the leaders demanded. Cherukari Rajkumar (1954-2010), popularly known as Azad, spokesperson of the Communist Party of India (Maoist), served the cause of the Indian revolution for over thirty five years till he was murdered by state forces on July 1, 2010. His leadership concentrated the very best of revolutionary Maoism in his adherence to principle, his reliance on the revolutionary masses, and his insistence on never deviating from the revolutionary goal. He fought against every mischaracterization of the revolutionary struggle, especially such claims that the Maoists were self-seeking, opportunistically using the masses. The people’s war, he insisted, was not of Maoists substituting themselves for the masses, but of the masses struggling for revolution and liberation in every sphere of life, and the role of the Maoists is to serve the revolution of the masses as organizers, leaders, educators, and defenders. He extended this view to the revolutionary overthrow of feudalism and capitalism which will establish a socialist state, in which the revolutionary Maoists will remain among the masses and continue the revolution, organizing and leading the struggle to transform every economic, political, and social relation, toward the final goal of communism. Today, on the third anniversary of his cowardly ambush-murder by the Indian fascist state, we honor his memory with a serious, internationalist red salute, and with the determination to continue his legacy. Q: There is a lot of talk about an unprecedented massive military offensive due to begin anytime now. How will your Party confront it? Azad: The fact is, the unprecedented massive offensive has already begun. In the Chintagufa area in Dantewada district almost 4000 police and Central forces led by around 600 elite commandos of the anti-Naxal COBRA force had carried out their biggest-ever counter-revolutionary operation called Operation Green Hunt in the third week of September. Some media reporters described it as Operation Red Hunt. Whatever is the name, it was the first major attempt by the Central and State forces to wrest a part of the territory from the hands of the oppressed people led by the Maoists. This operation was a sort of a rehearsal for the forthcoming Centrally-planned countrywide simultaneous offensive on all our guerrilla zones. When the enemy attack took place near Singanamadugu village, our forces present there were hardly 50 or 60 in number. But they fought heroically, and successfully repulsed the attack by a superior force, by totally relying on the people. It was the people who gave us the information regarding each and every movement of the enemy force. Hence our guerrillas could deal the first biggest blow to these so-called COBRAs who were specially trained in jungle warfare and sent to wage an unjust war against the Maoist revolutionaries. Six of their men including two assistant commandants—one from Manipur and another from UP—were wiped out in the real battle. These brave COBRAs demonstrated their heroism and courage by murdering seven unarmed adivasi villagers, including two aged men and a woman, and burning four villages. Not a single Maoist was killed contrary to the false claims of the police that 22 Maoists were killed. Our forces chased them for about 10 kilometres. The people of the entire area stood with us in this counter-attack on the thugs sent by Manmohan-Chidambaram’s khadi gang at the Centre and Raman Singh’s saffron gang in Chhattisgarh. This heroic resistance by a handful of Maoist guerrillas underscores the superiority of the tactics of guerrilla war and the massive mass support enjoyed by the Maoists. It demonstrates the ability of our Maoist guerrillas to confront and defeat a numerically far superior enemy force equipped with all the sophisticated weaponry, aerial support and what not, by relying on the sea of people in which we swim like fish. In the second week of October once again Chidambaram’s men unleashed another massive offensive by amassing 10, 000 men in Gadchiroli district in Maharashtra with MI-17 choppers surveying the area from the skies. It was as if an army from an enemy country was waging war on the Indian people. In the face of it our forces had successfully carried out a massive political campaign against the farce of the Assembly elections that were held on October 13 in Maharashtra. Here I shall not go into the concrete details of our precise tactics to confront and defeat the unprecedented, massive, brazen offensive on the most oppressed people being unleashed by the Indian ruling classes on behalf of the imperialists and the comprador big business houses. I can only confidently say one thing for the present: All our plans, policies, strategy and tactics will be based entirely on the active involvement of the vast masses of people in this war of self-defence. The enemy class cannot decimate us without decimating the entire population in the regions we control. And if it dares to go into an all-out war of extermination of the tribal population the entire socio-politico scene in India will undergo a fundamental shift and will witness a radical realignment of class forces. All peace-loving, democratic, patriotic, secular forces, all the downtrodden sections of the society will polarise into one pole while the most reactionary, anti-people, authoritarian, traitorous, jingoist counter-revolutionary forces will end up at the opposite pole. Such a polarisation is bound to take place as the war advances and the enemy’s mercenary forces attempt to turn central and eastern India into a graveyard. The warmongers will be isolated and will face unprecedented social and political crises. However, on behalf of our Party, PLGA, revolutionary mass organisations and organs of people’s democratic power, I can assure the people of our country that with their support, direct as well as indirect, we shall deal crushing blows on the enemy’s mercenary forces and defeat their plans to hand over these regions to the international and domestic bandicoots. Q: But your forces had killed around 20 policemen, most of them C-60 commandos, in Laheri in Gadchiroli district on the eve of the elections in Maharashtra. Is it not due to incidents like this which is provoking the government to deploy huge forces in these areas? The gangster community that made Indian Parliament its lair is in panic. Terrified. Aflutter. Seething. Fuming. Up in arms. Baying for blood. Baring its fangs. Spitting poison. After all the May 25 Jeeramghati attack struck down one of their best trusted lieutenants in field. Quite Understandable. Actually speaking, the scamster-gangster bunch does not care much for Mahendra Karma’s death because they knew that this was something waiting to happen even when they were carrying on mayhem and murder under Salwa Judum (SJ) which they all had contributed to create or let pester like senators watching gladiatorial contests in amphi-theaters, with Karma as SJ’s public face and with the support of fascist central and state mercenary armed forces. They are frightened more because in this country where every kind of exploitation, oppression, suppression, corruption and scam is carried on almost unchallenged, as the order of the day and shamelessly under public gaze, the fact that somebody ‘out there’ can bring these fascist scamster-gangsters to book and deliver justice is not so easy to stomach. It is like finding oneself completely naked and vulnerable with all robes of Z plus securities and paraphernalia of security suddenly vanishing into thin air with the fury of the suppressed masses breathing down their necks. Highly explicable. A strong reason to be upset. Who knows who will be next? More chillingly, what would be in store if people completely vexed with the increasingly unbearable treacherous, undemocratic, slavish and wicked anti-people deeds of the pet-dog politicians choose to consider this as an option to vent their ire to put an end to their habitual comprador performance? Even worse, what if they consider doing away with the whole bunch by overthrowing the parliamentary system as the Maoists vouch to and call upon the people to follow? Very worrying indeed. And for once it is better that they be. They better understand that not every politician can get away with the kind of neo-fascist suppression of the poorest of the poor of this country that was perpetrated in the name of a Salwa Judum, a Sendra, a Shanti Yatra, a Shanti Sena, a Harmad Bahini, a Bhairav Bahini, a TPC or an Operation Green Hunt, can get away with selling the riches of our country one by one as a daily routine at breakfast, lunch and dinner to fill the insatiable black-hole belly of the imperialist beast, can get away with turning every word that gives meaning to our existence as human beings like freedom, independence, sovereignty, self-reliance and democracy meaningless. They better realize for the umpteenth time (counting all such instances since the days of a Spartacus) that a people crushed so cruelly can never take everything lying down forever. For once it is better that they be alarmed. CPI-Maoists through posters have warned criminal groups and splinter outfits not to lift levy claiming to be Naxals in Ramgarh district. The posters were recovered by the Ramgarh police on Friday from Gola police station area. The Maoists on Friday early hours had to torch nine heavy vehicles and destroyed several engaged in road construction at Jogia village. The posters were recovered from the incident site. The banned outfit has lost its dominance areas in the district where splinter outfits like Jharkhand Jan Sangarsh Muktimorcha (JJSM) and Tritya Prastuti Committee (TPC) have managed to make their holds. According to police files many criminal groups posing to be Maoists have performed many loot, road dacoity and several other crimes. The posters also warned the business fraternity not to give levy demanded anyone other than the Maoist outfits. In bad news for security forces, Maoists have managed to form a Red corridor that gives them easy movement and safe passage through three states – Chhattisgarh, Odisha and Jharkhand. 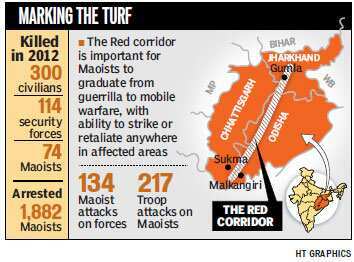 The term Red corridor has so far been used for the entire naxal-infested region in India that includes the three states as well as parts of Andhra Pradesh, Bihar, West Bengal and Maharashtra. But recent interrogation of arrested cadre has revealed it now literally means a narrow but contiguous strip that runs from the southern tip of Chhattisgarh to central Jharkhand – the two key theatres of naxal violence. Such a corridor would be crucial to the Maoist strategy of enabling free and safe movement of its military companies from one battlefield to another. Government sources told HT that Maoists arrested in recent weeks, including a courier, had confirmed the corridor was now in use. “A corridor is essentially a question of support structures. In recent times, they have strengthened themselves in Odisha’s heavily-forested Naupada district,” a home ministry official said.